Hello and thanks for stopping by. Working as a machinist and mechanic for most of my life and being involved in drag racing for many years, I saw the need for an outlet where a person could get the stainless fasteners they needed to improve the look of their car, or to get that custom bracket mounted etc. My wife, Debbie and I began selling stainless bolt kits in the year 2000 on E-bay. As our group of customers grew, we saw the need for our own Web Site. A place where you can purchase just what is needed and also get friendly advice on what to use for certain applications. Things grew at incredible rate and we brought our Daughter and Son-in-Law into the business to assist us with continuing the level of excellence we have given our customers in the past. We sell only the finest stainless steel fasteners and bolt kits for cars, trucks, boats, ATV’s and Harley-Davidsons here at AlloyBoltz. We have numerous engine kits and accessory kits including: carb stud kits, transmission kits, bellhousing kits, rear end cover kits, exhaust kits, and more. 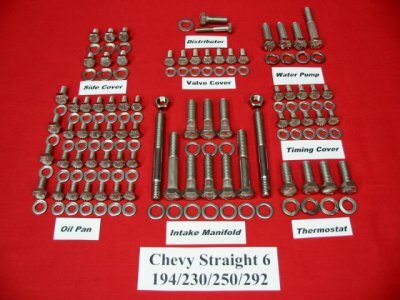 We cover nearly every bolt on Harleys and ATV’s. 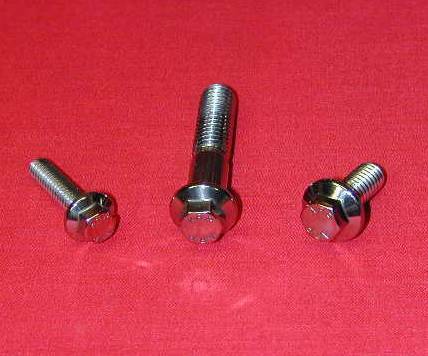 Many of our kits are available in hex head, indented hex head (original style), Allen head, and Grade 8 stainless ARP bolts for those who want the very best bolt kits available. Our large inventory of stainless fasteners is available to you, and you can purchase them in any quantity you wish, any bolt head style, and any grade of stainless. We do custom kits and will be happy to modify your kit to your engine so that you can use all of the bolts in our kits! We base our business on service, and high quality fasteners and kits. We want our customers to not only come back, but to refer us to their friends. We do our best to ship the same day a payment arrives. We pack our kits as carefully as possible to prevent any damage in shipping. If there is ever any kind of a problem, we will do whatever it takes to resolve it. Our goal is to keep our customers happy and coming back. We answer nearly all the emails we receive the same day or as quickly as possible. Russ passed away very unexpectedly in 2006, but our family has kept the business going out of respect to him. The Company is now a Veteran and Women owned business. He had visions for the business that we have strived to achieve and expand on. He instilled the values, vision and attention to detail to send high quality kits to the best customers in the world! We will continue to take care of you and send you the highest quality kits anywhere. We thank you for your continued support and business.